When I ran into former Brown captain, Michael Bernstein ’82 at a Red Sox game last summer, we hadn’t seen each other since he had graduated. Mike wanted an update on the team and asked several times what Brown rugby needed. Michael's request was timely as our Web site had been dormant and ignored for years and we had received some recent alumni criticism for having the worst site in the Ivy League. We can debate whose was the worst, but there is no debating that we needed a new look. Well, no more! 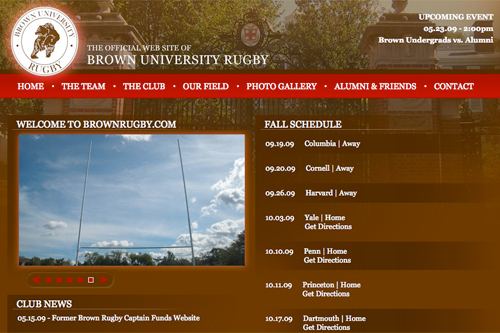 Mike offered a donation on the spot that has allowed us to build a new Web site that we are very proud to have and share with the entire Brown rugby family. The next step will be to keep it current, but Mike’s gift also includes training so that we can have a student Web Master to keep us all up to speed. We are indeed very grateful for Michael Bernstein’s generosity. We hope you will become familiar with the site and we look forward to keeping you all up to date on our schedule, matches, players, and history. The archive section will eventually have a section for each year of the club’s existence, from 1960 through the current year. If you have great recall and some good material from your era, consider volunteering to write up a year or two in which you played. We also have boxes of material that can be reviewed to get the facts correct. The great write-ups for 1960 and 1961 were generously provided by Bill Tingue ’62 and Allyn Freeman ’61.